These messages will display in edit mode only. The University of Cincinnati College-Conservatory of Music Wind Symphony presents an evening of inspiring works at 8 p.m. on Wednesday, Feb. 6, 2019, in Corbett Auditorium. Tickets are on sale now. Led by Kevin Michael Holzman, the Wind Symphony’s performance features John Williams’ epic "Jedi Steps and Finale" from Star Wars: The Force Awakens and Gustav Holst’s timeless classic Hammersmith, which was premiered by the United States Marine Band in 1932. The program also includes a new work by alumna Jennifer Jolley (MM, Composition, 2009). The Eyes of the World Are Upon You was originally commissioned in 2017 for the University of Texas Austin Wind Band. Jolley wrote it in memory of the 1966 University of Texas tower shooting, which was one of the first mass campus shootings in the United States. “This piece is a celebration of life: to those who died that day, but also to those who survived,” Jolley wrote in her program notes. View complete program details below. 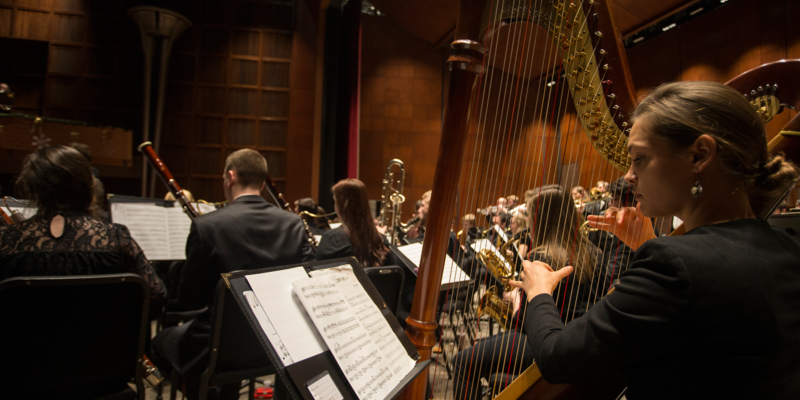 Tickets are on sale now for the Wind Symphony’s Wednesday, Feb. 6 concert. For more information about CCM's spring 2019 events, please visit uc.edu/news/articles/2018/12/n2057803.html. Tickets are $15 for general admission, $10 for non-UC students and FREE for UC students with a valid ID. General admission and non-UC student tickets are on sale now. UC students can obtain one free ticket each with valid ID beginning Monday, Feb. 4. Tickets can be purchased in person at the CCM Box Office, over the telephone at 513-556-4183 or online now through our e-Box Office! Visit ccm.uc.edu/boxoffice for CCM Box Office hours and location. Parking is available in the CCM Garage (located at the base of Corry Boulevard off Jefferson Avenue) and additional garages throughout the UC campus. Please visit uc.edu/parking for information on parking rates. For detailed maps and directions, please visit uc.edu/visitors. Additional parking is available off-campus at the U Square complex on Calhoun Street and other neighboring lots. For directions to CCM Village, visit ccm.uc.edu/about/directions.